TBAE offers interactive team building activities for schools that are adventurous, but safe. One of the best features of our activities is that everybody is able to participate, no matter their fitness level or physical abilities. Our team building events for schools are ideal for getting your group of teachers to work together more effectively, or to help a group of students to get to know each other better while having a fun time. TBAE is a completely mobile team building facilitation company and we are able to facilitate our mobile team building themes at your school or any other suitable venue. TBAE’s team building facilitators are all highly skilled, experienced facilitators who are committed to exceeding your expectations and making your school team building event a memorable occasion. We offer a vast array of team building exercises, both physical and mental, to achieve your objectives and make your school team building program unforgettable. Humour forms an important component of many of TBAE’s group team building activities. In these activities we use humour as our methodology of getting the participants to“drop their guard”. This is ideal, especially if you require “a fun day, where everyone gets to know each other”. 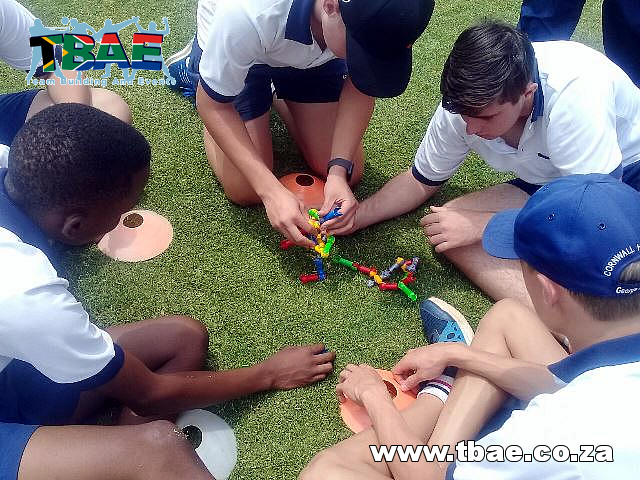 If you require more specific outcomes for your school team building event, TBAE has various outcome based activities which include outcomes such as communication, cooperation, goal setting, creative thinking, decision making, leadership, problem solving, resilience, time management and trust. TBAE also offers a wide variety of indoor team building activities for schools such as Minute to Win It, Murder Mystery, Drumming, Movie Making, Art Workshop and Creative Construction.